During the Iran-Iraq war his family fled to Alkhalafieh until 1998 when he was offered a place to study fisheries at the Industrial University of Isfahan and at the same time started his cultural and political activities at the student union there (Anjuman-e-Islami). In the first year of his degree he was appointed to the student union body and due to his hard work and commitment he gained students' support in the second year of his course was appointed as the general secretary of student community at the university. During the administration of the liberal Iranian president Mohammad Khatami and due to his political and cultural activities he managed to create and publish cultural newsletters at the university. These included the cultural and literary “Ghazal” newsletter in Farsi which used to be published monthly and the social and cultural “Altorath" (Heritage) newsletter in Arabic. Both gained lots of students attention and interest due to their subject matter and the concepts of civil society, democracy and freedom following years of isolation and repression prior to the Khatami presidency. One of the most important activities by Mohammad Ali Amori is the establishment of Iran’s ethnic nations congress in 2001 which had crucial role in bringing discriminated nations closer to each other. Many cultural activists, lecturers and poets attended the congress where they presented their thoughts present cultural events, exhibitions and folkloric activities representing each nation. These activities continued in the following year at the university and more students from different Iranian nations such as Kurds, Arabs, Balochis, Turks and Turkmens joined in and welcomed these activities. Amouri completed his degree and joined compulsory military service in the education department where he chose to teach in suburban and poor areas around Alkhalafyeh and continued his cultural activities. He established cultural and literary symposiums and through them he was able to raise awareness of Arabs, their suffering and encouraging their struggle against drug addiction and the unemployment among young people, where the highest rates are among Ahwazi Arabs, and challenging the backwardness caused by tribal conflicts. He also was able to encourage Ahwazi women to re-integrate within the society through involvement in education and work. He encouraged other students and graduates and lecturers to establish local NGOs in name of “ Al-Hewar” (Dialogue) during the second Khatami administration when there was some degree of freedom. The most important aims of “Al-Hewar” were to raise the level of cultural and scientific knowledge among students in Arab areas where they suffer deprivation and low educational performance due to discrimination by the central government. A year after “Al-Hewar” began its activities it was banned by the authorities due to a misunderstanding by local officials on Iran’s ethnic nations' cultural, political and social needs. Mohammad Ali Amouri was called by the Intelligence Service (Etellaat) on two occasions. They threatened to dismiss him from his job in the education authority and said he would not get a job after military service in any official departments in future if he continued his cultural activities. He was subsequently dismissed from his job. After the Intifada (Uprising) in April 2005, the Iranian authorities banned all cultural activities in Ahwaz. After the Khatami presidency ended, the Arab areas of Ahwaz were put under more security and greater restrictions. Amouri then went to Tehran, the capital city, as he was unable to get a job in Ahwaz. In Tehran he started work as translator for news agencies but was unable to secure an official job. He returned to Alkhalafyeh and worked in local agricultural authority. He started writing short stories for the "Al-Salam" newsletter in which he expressed Arab suffering and deprivations. He also got an opportunity to write about Ahwazi prisoners, the arbitrary repression by the intelligence services and lack of fair courts and discrimination of Ahwazi Arab detainees. Following increased pressure by the intelligence services, he decided to escape the country and entered Iraq illegally. There he claimed asylum with the UNCHR but he was arrested by the Iraqi authorities and under the Article 24 of Iraqi constitution was sentenced for five years and one month in Basra prison. In the prison his claim for asylum was accepted (No: 463-0913302). International human rights organisations and some diplomats called on Iraqi government to release him from prison. But the Iraqi government refused to release him and instead he was secretly transferred to Iran three years after his imprisonment. The Iranian intelligence services arrested and detained him in unknown area where he experienced severe physical and mental tortures and his younger brother was also arrested by the intelligence service to put him (Mohammad Ali) and his family more under pressure. On the same day his younger brother was arrested, their mother as a result of this had a stroke and admitted to ICU the local hospital. Also many of his friends and cultural activists were randomly arrested without any reason and charges. 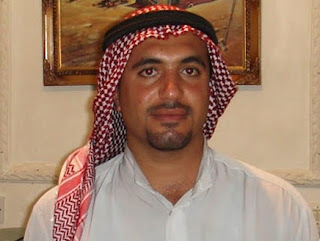 Six months later and after severe torture he was transferred to Karoun prison.